“Elektra” is a new play that presents a new twist on the very old story of the fall of Agamemnon. After returning from the Trojan War, Agamemnon’s wife Clytemnestra (Holley Garrison) avenges the daughter he sacrificed in order to gain the gods’ favor to wage war. The queen slays her husband and looks to do the same to her eldest son, the hero Orestes (Joel Byrd), but he is spirited away by his sister Elektra (Shanik Ifield) before he too meets the business end of the queen’s axe. This is where Tyler Junior College professor Denise Weatherly-Greene, or W-G as her students affectionately call her, deviates from the traditional mythos. Her story picks up at home, following Elektra’s journey as she clashes with her wicked mother. Ifield delivers a powerful performance, displaying rage and grief alternately, as she and the chorus members, who represent different parts of the city-state’s population, plot to take their land back. 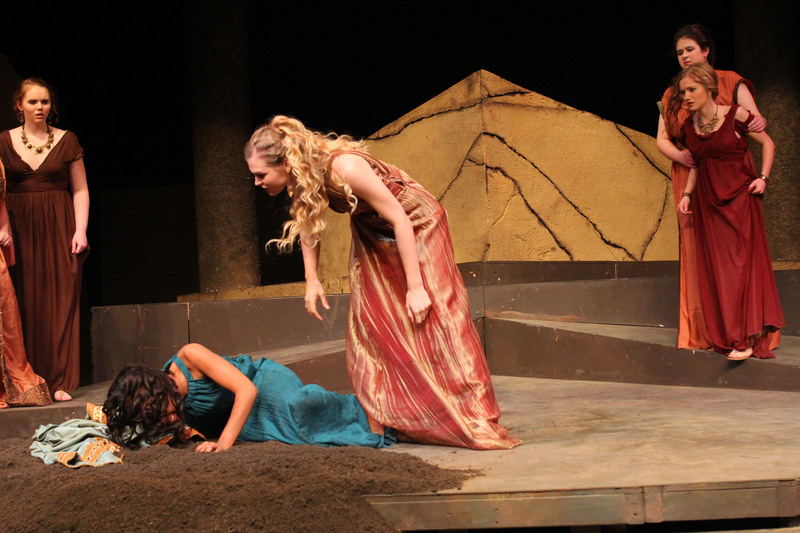 Prof. Weatherly-Greene has created a strong juxtaposition using the small frames of both Elektra and the enraged chorus member (Leslee Woytek), who take turns confronting the comparatively massive new king, the usurper Aegisthus (Jacob Charlebois). Whether those clashes are physical or verbal, these two tiny actresses manage to make a man almost twice their size seem small. “It’s about doing what is right, no matter what the cost is, to her or whatever family she might have at home,” Woytek said. The one act play is a whirlwind of passion and fury, hitting all the right notes as the tension builds toward the finale. Prof. Weatherly-Greene has studied the era and plays based upon it in great detail in order to bring her own work the feel of an epic that could have been written millennia ago. The powerful female leads mark the biggest change from the Greek standards. Rather than Elektra standing idly by while Orestes cleanses the kingdom, W-G’s lead pushes the action forward. Ifield, Woytek and Wright are powerhouses in their roles. Each approaching the drama from different angles, constantly clashing with each other. These are not women who need a man to handle their dirty work. Wright actually chews at the scenery, gleefully swinging around the hefty battle-axe made by art department. The language is authentic, the costumes and weaponry have been painstakingly recreated and the set design is simple, yet elegant. While the cast may be made up of students, the audience will surely think they’re watching seasoned pros. “You don’t have to be a large person or in great power to cast a large shadow,” said Ifield.